Boston's 84-74 victory over the Pacers in Game One was a lesson in defense from both teams. The Celtics ended up 28 points under their season-average of 112, while the Pacers were 34 points under their 108-point average. Bojan Bogdanovic was held to only 12 points on 4-of-11 shooting, well under his 18-point season average. Boston's trio of Jaylen Brown, Gordon Hayward and Jayson Tatum did a great job keeping Bojan in check. 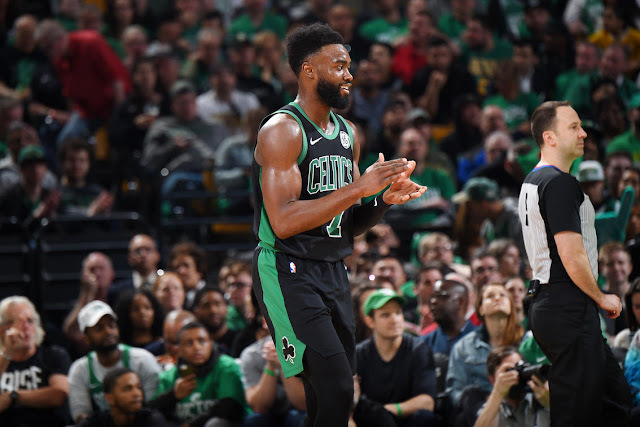 Jaylen, filling in for Marcus Smart in the starting unit, did his best to be a defensive disruptor in Smart-mode, including a shove to the back of Bogdanovic. That earned Jaylen a technical, but nothing more. Aron Baynes made it a point to corral him quite effectively. Look for Indiana to look for ways to get Bojan more open looks next game. Brown only scored two points in the game on 1-of-5 shooting, but the one hoop was a baseline drive and jam. With his quick first step, he needs to do more of that. The late Reggie Lewis was known, in part, for his explosive baseline drives and stuffs. Jaylen needs to follow that lead.